More than 100 CEOs from 16 countries participated in the first ever ICC Asia Pacific CEO Forum. The International Chamber of Commerce India today concluded two days of intensive meetings with CEOs and senior government officials designed to discuss how the Asia-Pacific region can help stimulate the global economy and generate policy recommendations for G20 leaders. More than 100 CEOs from 16 countries participated in the first ever ICC Asia Pacific CEO Forum, organized by ICC India in New Delhi. Senior officials from the Indian government addressing participants at different sessions included: Anand Sharma, Minister of Commerce, Industry and Textiles; Salman Khurshid, Minister of External Affairs; Chakravarthi Rangarajan, Chairman, Prime Minister’s Economic Advisory Council; Montek Singh Ahluwalia, Deputy Chairman, Planning Commission; and Ravi Shankar Prasad, General Secretary and Chief Spokesperson of Bhartiya Janta Party, Member of Parliament and Deputy Leader of Opposition in the Rajya Sabha. “The ICC Asia Pacific CEO Forum has provided a very timely occasion for ensuring that the concerns and challenges facing businesses large and small in this region, including rebuilding the region’s financial architecture and generating sustainable growth for Indian businesses are clearly positioned for consideration of all Governments,” said Harsh Pati Singhania, President, ICC India and Managing Director of JK Paper. “As one of the G20’s emerging economies, Indian business is particularly well placed to drive global economic growth and generate jobs here in Asia,” he said. The two-day ICC Asia Pacific CEO Forum featured discussion on topical subjects including the emerging financial architecture in the Asia Pacific Region, new ideas and approaches to sustainable growth, as well as emerging business opportunities and challenges. “We are very pleased that the CEO Forum has given diverse voices from Asia and the Pacific region the opportunity to be heard and to be relevant to the global policy debates that ultimately impact their commercial opportunities, investments and trade,” said Victor K. Fung, ICC Honorary Chairman and Chairman of Hong Kong based Li & Fung Group. 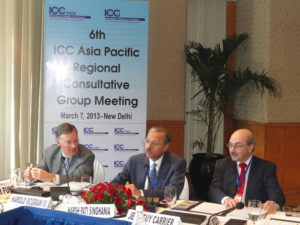 The ICC meetings also included a G20 policy consultation on 7 March, hosted by ICC India. ICC’s regional policy consultations are designed to provide local businesses with an opportunity to help shape ICC’s policy recommendations for input into the G20 process. Participants were invited to share views and priorities on a set of policy recommendations that are being produced for transmission to G20 leaders. During the roundtable discussion, participants were invited to share views on a range of policy issues under discussion by G20 leaders. Topics were derived from priorities expressed by the Russian government and mirror the ongoing efforts by CEO-led task forces working collectively under the “Business-20” – or B20 – umbrella; these included trade, investments and infrastructure and the role of innovation in energy and communications technologies. “Results from the consultation will be fed into the business recommendations that are being produced for transmission to G20 leaders,” said ICC Secretary General Jean-Guy Carrier. “The results from this policy consultation will be conveyed to the respective B20 task force leaders in Moscow so as to ensure that business recommendations reflect the broad base of companies large and small in all regions of the world,” said Harold McGraw III, Vice-Chairman, ICC; Chairman and CEO, The McGraw-Hill Companies. The ICC G20 policy element of the ICC Asia Pacific Forum is one of a series of similar events sponsored by ICC over the last two years. To date, these meetings have been held in: Beijing, Berlin, Doha, Hong Kong, Istanbul, Jakarta, Johannesburg, Melbourne, Mexico City, Zurich, Washington DC, and future meetings during 2013 are planned in Buenos Aires, Canberra, Geneva, London, Riyadh, and Sydney.